I've been trying to stick to having no gluten in my diet. I'm not always 100% gluten-free, but I try. I've read that people with bad allergies (me) should try and stay away from gluten. Another reason to be gluten-free is people that have, or are at high risk for getting Celiac disease. It is a condition that damages the lining of the small intestine and prevents it from absorbing parts of food that are important for staying healthy. Gluten is like glue in the stomach. I have to say that either the detox I'm taking, or me watching the foods I'm eating has really helped me in terms of stomach issues. I do still have allergies. But I'm not taking any meds, and I'm better than I was last year - so far. 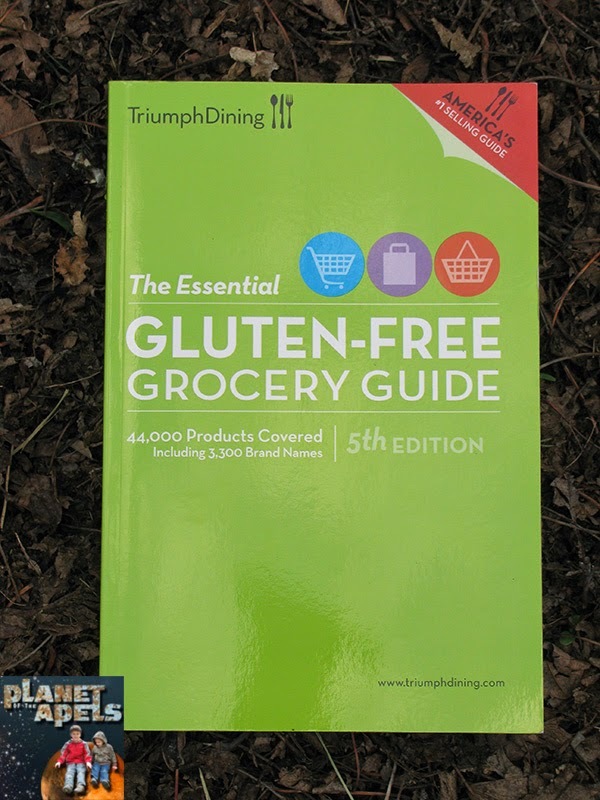 I was sent The Essential Gluten-Free Grocery Guide - 5th Edition Review by TriuphDining. *A $27.95 value. It's marked down to $24.95 right now. It is available on the App Store. Don't let this little book fool you! It has a lot of information in it! You can find more than 44,000 brand-name and store-brand gluten-free products at grocery stores across the U.S. There is a color-coded system, which makes meal planning and finding your favorite foods easy. It's a 5th edition. I'm a teacher, and I know whenever there is editions the book is good enough to be on my shelf. There is 280 time-saving and budget-friendly pages. America's #1 Selling Gluten-Free grocery guide. When is this book useful? I think it's helpful for when you go on a trip, or any shopping experience really. I just mentioned a trip because I can for see traveling making it harder to pick out places to get foods that are safe to eat. The book lists types of products, where you can get gluten-free products, and the brand name, so you can buy it. Gluten is in a lot of things, it's even in things like condiments, sauces and dressings. It's a big problem for someone with Celiac disease. Lets say I'm looking for Barbeque Sauce. I thumb through the book to find Condiments, Sauces and Dressings. The book has 55 places (if I counted right) to seek out to get gluten-free Barbeque Sauce. Underneath those places the book will tell you if you can get all their BBQ sauces, or specifically what you can get that's their gluten-free variety. I have a Hy-Vee grocery store in my town. They have their own brand. I looked them up in the book, and they have Hickory BBQ Sauce, Honey Smoke BBQ Sauce, and Original BBQ Sauce. Now I know that Hy-Vee has 3 gluten-free BBQ sauces I can get. The only downside, and this isn't the book's fault is smaller towns don't have the options for gluten-free products like bigger towns. If you have shopping limitations, than the book may not be as handy in the small town you live in. Save it for when you travel though. We don;t eat gluten free, although I have been toying with the idea for my little one who has focus issues in school. If you are on a gluten-free diet this looks like a great book to have! Thanks for sharing your review. Have a terrific day! What a great guide! My neighbor has gluten sensitivities and I bet she would really benefit from this guide. I am going to share the title with her! I eat mostly gluten free but not entirely. I do know that when I eat gluten free, it digests better. my cousin tries to eat gluten free... she might like this book.